The Karratha Health Campus in Karratha, Western Australia is a major infrastructure project, planned to transform health services in the region. The $207 million project is the largest infrastructure investment in regional WA’s history, and is being executed by Multiplex. 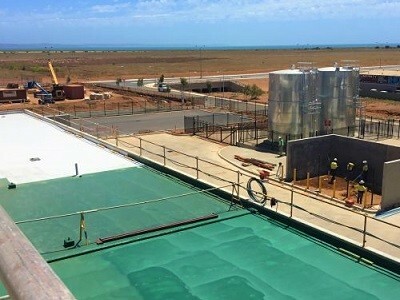 Envirosystems Technologies was selected to provide environmentally responsible waterproofing solutions for the Karratha Health Campus project. Four products – Enviro 700PUR, HP1200, Prime P2, 850PUR T.C and Epoxy RC – were specified for the project involving an area of 10,000 square metres. Designed and manufactured in Australia to withstand the harshest conditions, Envirosystems products incorporate the latest technology: the low VOC content, absence of solvents, odourless solutions and environment-friendly accreditation ensured this was the best possible solution for this critical piece of healthcare infrastructure.